“Anumuthu get up! It’s 5:30 get ready son! We have to go, otherwise we will be late!”, my mom shouted. I remember waking up crying out loud, refusing to go with her, but when I looked at her face, I could see the great love and responsibility to feed the family, which forced me to go with her and work despite my age. I was born in a poor family, my father was a woodcutter and my mother was a house wife. Although we did not have much, we were a happy family. We used to enjoy playing throughout the day and eating every time we were hungry. Unexpectedly, my father died. Our life suddenly changed all the responsibilities for me and my 2-year-old sister was left to my mom. Besides being a housewife, my mom had never worked in any profession. We had no property to sell that could provide funds to live; neither did we have relatives to help us. Therefore, my mom and I started working as daily laborers, every day from 6am to 2pm in the farm. I was only seven years old, working among adults in the hot sun and was expected to yield the same harvest with everyone. This was very difficult for me especially harvesting cotton because it used scratch my skin. It hurt me so I cried a lot. My mom would get Rs.6/- and I would get Rs.4/- so a total of Rs.10/- per day. This had to feed four people because my old grandfather was also staying with us. Rice water and pickle was the daily food. Many nights we slept with an empty stomach. My family and I used to long for good food; however, this was an impossible dream. At the age of 11, my life took a turn for the better. A kindhearted Catholic priest Rev. Joe Arimpoor SDB, came and rescued me from child labour. He put me in a boarding school where I completed my schooling, electrical training as well as qualified professional ad filmmaker, which gave me a job. In the year 2000 on Christmas day around 9 clock, as I was crossing street, I heard a groaning sound of a person, when I looked I saw one old naked man, who curled up his body just to stay warm in the freezing cold. I ran to the public telephone booth and called my uncle to ask him for one old bed sheet so I could give this to the old man on the street. The surprising answer I got is “I don’t have sheets to give away”. This made me think and question the insensitivity of rich people towards the poor and needy ones. I went home with a heavy heart. This incident pinched me to work with the homeless people on the streets. As a filmmaker, I visualize and bring the imperfect scenes to perfect scenes during editing. However, the reality stands the same. 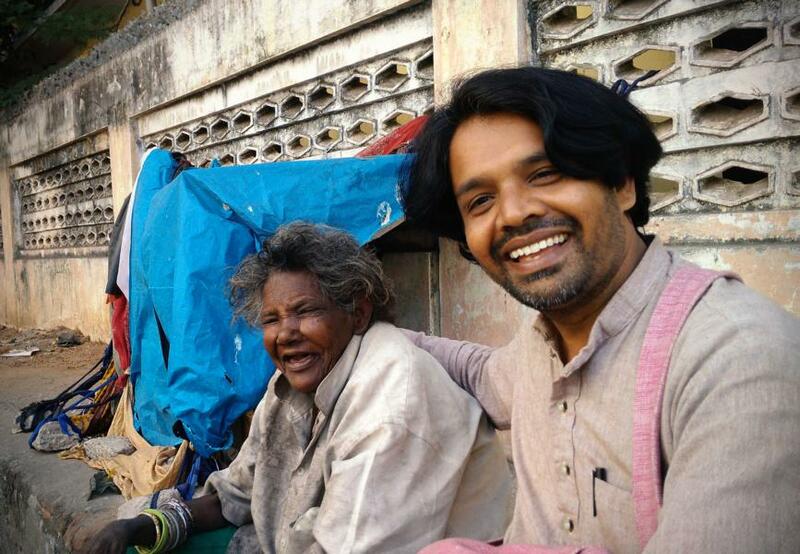 These kinds of heart touching experience brought many questions within me, finally I quit my profession, to work with homeless deprived people on the streets of Pondicherry, to edit and bring changes in their real lives. According to me, everyone is important and valuable. Having firsthand knowledge of poverty, hunger, rejection, loneliness and depression, I decided to dedicate my life to work with deprived people who live on the street. I relate to them because they face similar sufferings like I and my family had. So I started volunteering my service on Sunday’s in Mother Teresa home and ‘Birds of the Air’ organization, we used to pack up food and clean cloths packets, go around street by meeting meek and sick homeless people on the streets, giving them food and listening to them, which raised my spirit and gave me focus to work with them. My vision is to see a culture where deprived homeless people are accepted, valued, loved and live together as normal human beings in society.